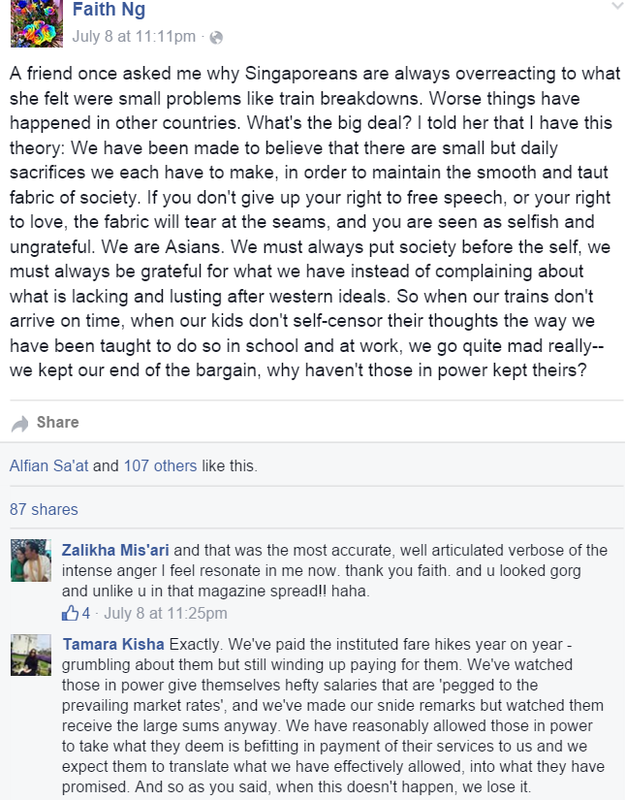 Why Do Singaporeans Get So Upset About MRT Breakdowns? This article is written for those who feel that Singaporeans as ‘pampered’ and overreacting about the MRT breakdowns. I am a regular Singaporean who takes the MRT to and from work every day. In the past few years, there have been quite a few major train breakdowns. The first major one in December 2011. There were promises to improve things since then. However, minor train disruptions still happen almost daily on my way to work. Whenever I take the East West line before and after work, the train often stops in the middle of the track for about 2 minutes before resuming its journey. Major disruptions continue multiple times annually. This year itself, there were multiple major disruptions in the first quarter of the year. I was born in the 1990s and this has never occurred in my many years of living in Singapore before infrastructure failed to keep up with immigration. 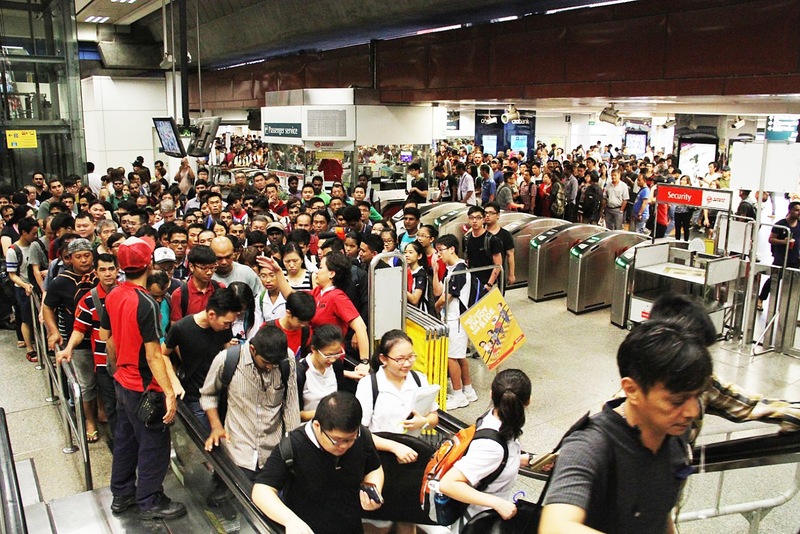 Earlier in July, what could potentially be the worst MRT breakdown to date occurred. During the peak period where most Singaporeans needed the train the most, the North-South and East-West lines were down for hours. During that period, I saw quite a few comments online about Singaporeans being spoilt to be so upset about a train breakdown. Others called us for being unreasonable and defended SMRT saying that train breakdowns are normal given that these two lines were the first major lines to be built and inefficiencies are inevitable. Thus, I hope to provide my perspective as a local to share insights as to why Singaporean’s reactions were more than reasonable and why train disruptions are so incredibly frustrating and upsetting for Singaporeans. The CEO of SMRT, Mr Desmond Kuek, has seen his salary increase from around $500,000 in 2013 to $2.5 million in 2015. This money comes from tax payers given that we pay fees for riding the train and that SMRT is supported by public funds although it is a ‘private company’. Read: Why spend public funds for private use? On the other hand, fares for commuters increased by 2.8 % just a few months ago. Given that the CEO is paid so much more and fares are increasing each year, it is only reasonable that Singaporeans have high standards of the public transport. You pay what you get for right? However, what hasn’t increased at all is the reliability and efficiency of our public transport system. It is just as overcrowded as a few years ago (if not more) and train breakdowns are much more frequent. The same argument above can be used to answer why Singaporeans have such high expectations of their ministers. I mean if you hire an employee and pay him $5000 a month, you’d naturally expect much more from him than someone in the same role that gets only $1000 a month. Similarly, our attitude towards ministers are if you are paid so handsomely with taxpayer’s money, you’d better do a good job to prove you are worth that sum. While some may point out that things are not so rosy for SMRT as they are constantly being fined by the Land Transport Authority, I personally find it ineffective and just for show. After all, both SMRT and SBS just received 1 million in April 2015 for “better service“. Seriously, what is the purpose of such hefty fines? Nothing gets improved and SMRT continues to receive public funding. It is just left pocket out, right pocket in. With public transport standards declining over time; taxis becoming complacent and having poor service and private transport now being out of reach of the ordinary Singaporeans; it is no surprise that transport apps like Grab and Uber are becoming increasingly popular. If the MRT train breakdown elsewhere, people still have the luxury of private transport. However, in Singapore, for the majority of the population i.e. lower and middle-income Singaporeans, public transport is our only option. Private transport has become a luxury. Cars are incredibly expensive. The government has recently also increased the COE premium of motorcycles which in my opinion is pretty stupid. Not only does this policy harm poor people in Singapore, it is also ineffective in solving the road congestion problem. Motorcycles only have a minimal impact on road congestion and pollution with a 7 percent increase in bikes compared to a 53 percent increase in cars from 2003 to 2013. Given that Singaporeans are forced to rely on public transport, all the more we expect it to be run well. Personally, I think that the only way to stop congestion in Singapore is first to stop overrelying on immigration as a means for economic growth and secondly, to improve the speed, reach and reliability of our public transport. This point was raised by playwright Faith Ng which I felt was extremely well written and true. Singaporeans have been told this narrative for a long time that we are young, vulnerable, no natural resources blah blah… thus, we all have to give up sacrifices to ensure our society is peaceful and things run smoothly. For instance if we don’t give up our rights to free speech; rights to press freedom; rights to free assembly; rights to love someone of the same gender, the consequences are dire. There will be racial riots, we will become uncompetitive and families will break apart. We’re also told that our society is run on Asian values where we’ve to put this community before ourselves. In return, we’d be given a good life with world class transport, healthcare, education blah blah. So when our trains don’t arrive on time, people get upset because we feel we’ve kept our end of the bargain, why haven’t those in power kept theirs? One of the ways the Singapore government tries to instill a sense of pride in us is to constantly give us the impression that we are the best. Our pride and identity as Singaporeans is derived from the fact that we have world class standards of living and world class education, healthcare, transport etc. Thus when trains break down so frequently all of a sudden, Singaporeans start to see that our transport system is no longer the best, that even cities like Moscow have much better public transport system. This threatens our deeply held beliefs about Singapore and pride in our nation. So, before you label Singaporeans for being too pampered because we’re upset about train breakdowns, try to see things from the perspective of the mainstream Singaporean. Things are different when you are born in an era where public transport ran smoothly and then declined over the years. Compared to if you came from a country with poor public transport and moved to one with a better system. Things are different when you are living in a country where public transport fares grow each year along with the ceo’s salary and yet no improvement is being made. Things are different in a country where most people only have public transport as an option. Things are different when citizens are told they should make sacrifices in their life to keep things running smoothly only to realize those in power did not keep their end of the bargain. So, please don’t be too quick to judge us Singaporeans as pampered individuals who are just over reacting about the MRT breakdowns. Please share this post with your friends so they can understand our situation. Is being aggressive and opinionated the best way to achieve social change?